Die Jovis, videlicet, 2 die Junii. Message from the H. C. for the Committees to meet about putting the Militia in Execution. The Cause opened by Mr. Glyn. This Cause to be further heard. Propositions to the King to be printed. 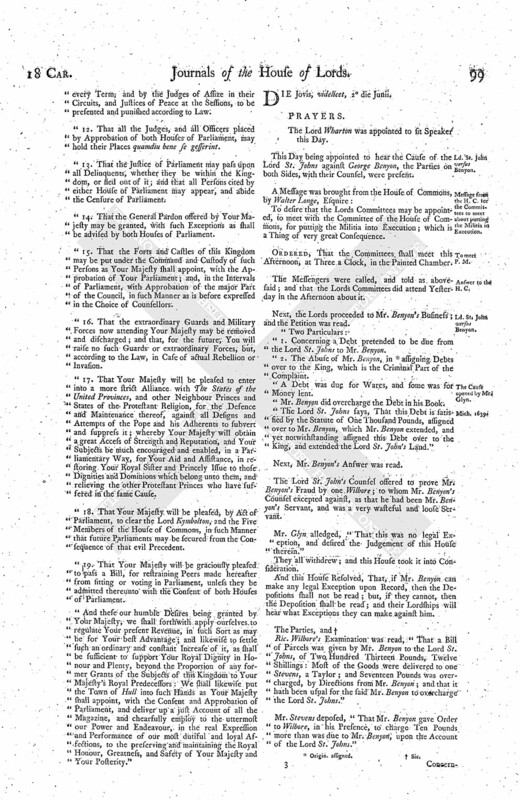 This Day being appointed to hear the Cause of the Lord St. Johns against George Benyon, the Parties on both Sides, with their Counsel, were present. To desire that the Lords Committees may be appointed, to meet with the Committee of the House of Commons, for putting the Militia into Execution; which is a Thing of very great Consequence. Ordered, That the Committees shall meet this Afternoon, at Three a Clock, in the Painted Chamber. The Messengers were called, and told as abovesaid; and that the Lords Committees did attend Yesterday in the Afternoon about it. Next, the Lords proceeded to Mr. Benyon's Business; and the Petition was read. 1. Concerning a Debt pretended to be due from the Lord St. Johns to Mr. Benyon. 2. The Abuse of Mr. Benyon, in (fn. 1) assigning Debts over to the King, which is the Criminal Part of the Complaint. A Debt was due for Wares, and some was for Money lent. Mr. Benyon did overcharge the Debt in his Book. The Lord St. Johns says, That this Debt is satisfied by the Statute of One Thousand Pounds, assigned over to Mr. Benyon, which Mr. Benyon extended, and yet notwithstanding assigned this Debt over to the King, and extended the Lord St. John's Land." Next, Mr. Benyon's Answer was read. The Lord St. John's Counsel offered to prove Mr. Benyon's Fraud by one Wilbore; to whom Mr. Benyon's Counsel excepted against, as that he had been Mr. Benyon's Servant, and was a very wasteful and loose Servant. Mr. Glyn alledged, "That this was no legal Exeption, and desired the Judgement of this House therein." They all withdrew; and this House took it into Consideration. And this House Resolved, That, if Mr. Benyon can make any legal Exception upon Record, then the Depositions shall not be read; but, if they cannot, then the Deposition shall be read; and their Lordships will hear what Exceptions they can make against him. Ric. 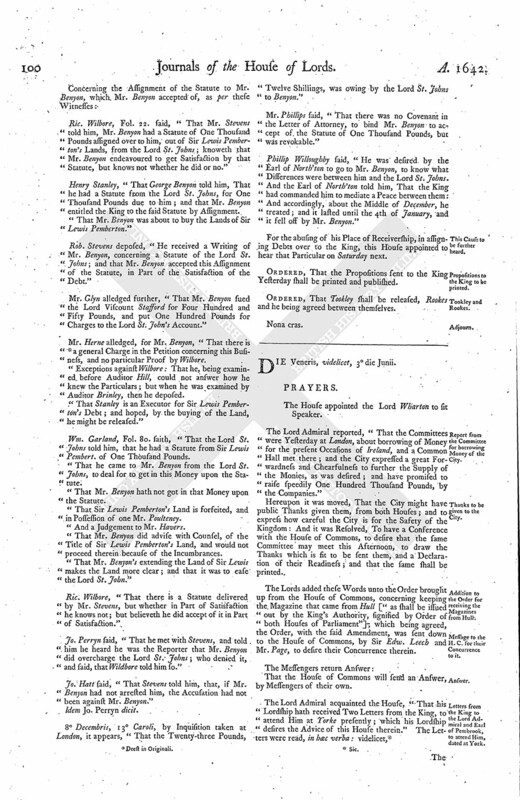 Wilbore's Examination was read, "That a Bill of Parcels was given by Mr. Benyon to the Lord St. Johns, of Two Hundred Thirteen Pounds, Twelve Shillings: Most of the Goods were delivered to one Stevens, a Taylor; and Seventeen Pounds was overcharged, by Directions from Mr. Benyon; and that it hath been usual for the said Mr. Benyon to overcharge the Lord St. Johns." Mr. Stevens deposed, "That Mr. Benyon gave Order to Wilbore, in his Presence, to charge Ten Pounds more than was due to Mr. Benyon, upon the Account of the Lord St. Johns." Ric. Wilbore, Fol. 22. said, "That Mr. Stevens told him, Mr. Benyon had a Statute of One Thousand Pounds assigned over to him, out of Sir Lewis Pemberton's Lands, from the Lord St. Johns; knoweth that Mr. Benyon endeavoured to get Satisfaction by that Statute, but knows not whether he did or no." Henry Stanley, "That George Benyon told him, That he had a Statute from the Lord St. Johns, for One Thousand Pounds due to him; and that Mr. Benyon entitled the King to the said Statute by Assignment. That Mr. Benyon was about to buy the Lands of Sir Lewis Pemberton." Rob. Stevens deposed, "He received a Writing of Mr. Benyon, concerning a Statute of the Lord St. Johns; and that Mr. Benyon accepted this Assignment of the Statute, in Part of the Satisfaction of the Debt." Mr. Glyn alledged further, "That Mr. Benyon sued the Lord Viscount Stafford for Four Hundred and Fifty Pounds, and put One Hundred Pounds for Charges to the Lord St. John's Account." Mr. Herne alledged, for Mr. Benyon, "That there is (fn. 3) a general Charge in the Petition concerning this Business, and no particular Proof by Wilbore. Exceptions against Wilbore: That he, being examined before Auditor Hill, could not answer how he knew the Particulars; but when he was examined by Auditor Brinley, then he deposed. "That Stanley is an Executor for Sir Lewis Pemberton's Debt; and hoped, by the buying of the Land, he might be released." Wm. Garland, Fol. 80. saith, "That the Lord St. Johns told him, that he had a Statute from Sir Lewis Pembert. of One Thousand Pounds. That he came to Mr. Benyon from the Lord St. Johns, to deal for to get in this Money upon the Statute. That Mr. Benyon hath not got in that Money upon the Statute. That Sir Lewis Pemberton's Land is forfeited, and in Possession of one Mr. Poulteney. And a Judgement to Mr. Havers. That Mr. Benyon did advise with Counsel, of the Title of Sir Lewis Pemberton's Land, and would not proceed therein because of the Incumbrances. "That Mr. Benyon's extending the Land of Sir Lewis makes the Land more clear; and that it was to ease the Lord St. John." Ric. Wilbore, "That there is a Statute delivered by Mr. Stevens, but whether in Part of Satisfaction he knows not; but believeth he did accept of it in Part of Satisfaction." Jo. Perryn said, "That he met with Stevens, and told him he heard he was the Reporter that Mr. Benyon did overcharge the Lord St. Johns; who denied it, and said, that Wildbore told him so." Jo. Hatt said, "That Stevens told him, that, if Mr. Benyon had not arrested him, the Accusation had not been against Mr. Benyon." 8 Decembris, 13° Caroli, by Inquisition taken at London, it appears, "That the Twenty-three Pounds, Twelve Shillings, was owing by the Lord St. Johns to Benyon." Mr. Phillips said, "That there was no Covenant in the Letter of Attorney, to bind Mr. Benyon to accept of the Statute of One Thousand Pounds, but was revokable." Phillip Willoughby said, "He was desired by the Earl of North'ton to go to Mr. Benyon, to know what Differences were between him and the Lord St. Johns. And the Earl of North'ton told him, That the King had commanded him to mediate a Peace between them: And accordingly, about the Middle of December, he treated; and it lasted until the 4th of January, and it fell off by Mr. Benyon." For the abusing of his Place of Receivership, in assigning Debts over to the King, this House appointed to hear that Particular on Saturday next. Ordered, That the Propositions sent to the King Yesterday shall be printed and published. Ordered, That Tookley shall be released, Rookes and he being agreed between themselves.